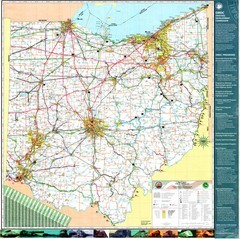 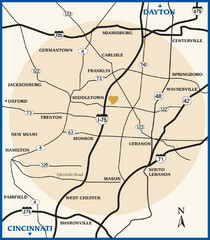 Official NPS map of Dayton Aviation Heritage National Historical Park in Ohio. 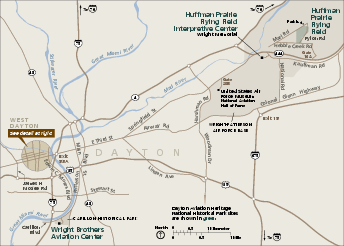 Dayton Aviation Heritage National Historical Park, a four-unit park is located in and around Dayton, Ohio. 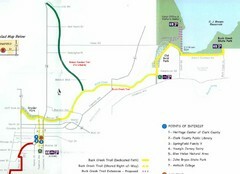 The units include: The Wright Cycle Company Complex, consisting of The Wright-Dunbar Interpretive Center and Aviation Trail Visitor Center and Museum and The Wright Cycle Company; The Paul Laurence Dunbar House; Dayton History at Carillon Park; the Huffman Prairie Flying Field and Interpretive Center.